Still vegetating on the couch, this time with Amazon Prime's selection of films to keep me entertained. After a vote of no confidence in my ability to do anything useful, the internal negotiations about exercise regime continue with no concrete deal in place (#topicaljoke). Meanwhile, I caught up on a few well-received films from last year. Be warned though: these aren't the happiest films in the world. First Reformed (Paul Schrader, 2018) is the film to watch if you ever wondered what Travis Bickle would be like if he moved upstate and became a pastor. Well, wonder no more, because Schrader (who wrote Taxi Driver) returns to a favourite trope of his; that of the tortured, male loner. 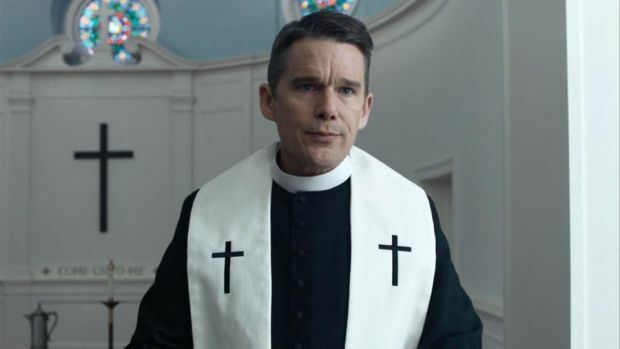 Here, the lost soul is Reverend Toller (Ethan Hawke), a man struggling with his faith, his health and various personal demons. An attempt to counsel a depressed young man on the request of his wife (Amanda Seyfried) only serves to worsen his spiritual crisis and a bleak drama ensues. In the holy agony of the central religious character, there's echoes of Bresson's Diary of a Country Priest and Bergman's Winter Light, films which Schrader has long admired. So there's some intellectual food-for-thought and it's not quite as boring as those two films (he wrote, mainly to annoy film cineastes). Hawke is very good, as is comedian Cedric Kyles (aka Cedric the Entertainer) in a rare, straight role. There's a lot to admire, even if it is heavy going. But that was all undone by the film's ending, which apparently couldn't decide what it wanted to be and ends up being rather ridiculous. Not one to watch if you're feeling a bit down. Leave No Trace (Debra Glanik, 2018) is better. Glanik's first feature film since the excellent Winter's Bone in 2010 is a similarly quiet, composed affair with a strong emotional core. Will (Ben Foster) is living off-the-grid in the forests of Oregon with his 13-year-old daughter Tom (Thomasin McKenzie), isolated from society and subsisting off the land. However, events conspire to involve social services, creating a rift between father and daughter which threatens their simple existence. This all plays out beautifully, never grandstanding or over-stating its themes, just content to tell its story in low-key, but affecting fashion. Foster (who worked with Glanik to strip his character's dialogue back to the bare minimum) is really good, but McKenzie is the real standout here. The coming-of-age aspect of the film depends on her and she is never less than convincing as the child who starts to question her father's choices, whilst still loving him. If there is any justice, this'll catapult her to stardom in the same way Winter's Bone did for Jennifer Lawrence. A fine film, but not one to watch if you're having doubts about how you are bringing up your kids though. You Were Never Really Here (Lynne Ramsay, 2018) is my pick of the three films featured here. Joe (Joaquin Phoenix) is a hired assassin who specializes in retrieving girls who have gone missing in sinister circumstances. Unfortunately, Joe is himself badly traumatized by his past and somewhat suicidal, which isn't going to help on his latest job. There's not much more to it story-wise, but this is all about the presentation. Ramsay's disorientating, kaleidoscopic approach to the editing of the film elevates a straightforward hitman film into something much more profound. Phoenix, an actor who often gives the impression of being disconnected from reality, is perfect for the role, conveying both gentleness and brutality in his depiction of a emotionally fragile man mired in violence. Add to that Jonny Greenwood's eerie score and some brilliant use of other music (we really need to talk about the CCTV-Angel Baby sequence which is mesmerizing) and you've got a unique vision of one man's hell. It might be dream-like and baffling at times, but it's hard to forget, and a further reminder of Ramsay's singular talent as a filmmaker. In fact, it might just be my favourite film of 2018, but certainly not one to watch if you're expecting a slick John Wick type of affair. So not the happiest selection of viewing to start the year off, but all 3 appeared in various Top 10 list of 2018, including Sight & Sound, Little White Lies, The Playlist, with others (Mark Kermode, Indiewire, Esquire and The A.V. Club ) variously name-checking at least 1 of them in their countdowns. So either they're all wrong, or they're just miserable gits. Happy(?) viewing.